According to Phillies executive Howard Smith, it was the result of a bad forecast on Friday that produced far more rain than expected. With the team on the road, the infield was left uncovered. The Phillies played a three-game series in New York over the weekend, so the decision to leave the field uncovered Friday was basically locked into place Saturday and Sunday while the entire mid-Atlantic region got drenched. 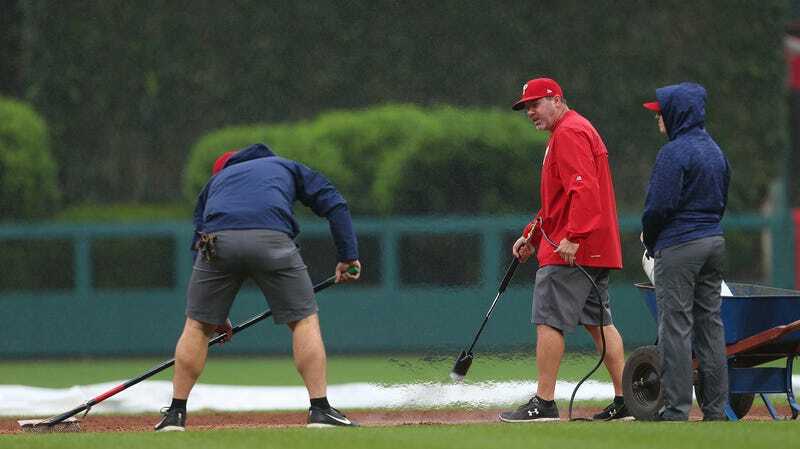 The tarps were eventually rolled out due to early rain on Monday, but the damage was already done, and the infield was a soggy mess when players showed up this afternoon. Every effort was made to dry the infield dirt, and when I say “every effort,” boy do I mean every effort. They busted out the flamethrowers! Hard to accept that the Phillies have flamethrowers hanging around their stadium and they aren’t using them for spectacular bank robberies or whatever.